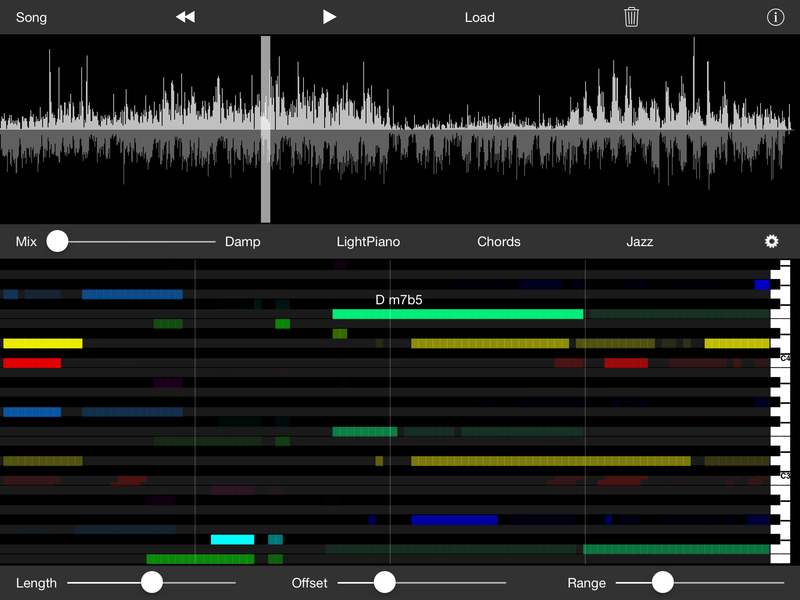 MUSYS is an interactive music analysis and synthesis app. Use it to play along with music, analyze and transcribe songs in your iTunes library or imported WAV files. As a song plays music analysis algorithms automatically detect pitch, scale/key, and chords. Results are displayed using a sonogram/chromagram representation that the user can play using what we call a "smart" synth. Automatic pitch and chord detection from audio is difficult in most practical situations. Accurate chord detection is perhaps the most difficult problem. Often not all chord tones are detected, let alone heard, masked by lead instruments, bass, and drums. Although MUSYS does not always detect the correct chord, most chords are "close" to the correct choice. By playing and listening to different detected chords along with the music being played it is usually pretty easy to select the correct one. MUSYS thus operates on the principle of "analysis through synthesis" -- of using your musical ear to make the correct decision. Before going any further let's listen to a few sound examples. The first example plays Bach flute music. The detected melody is displayed and then played, illustrating how MUSYS can be used for transcription. Next let's listen and play along with Coltrane's Mr. P.C. The next example is from Joe Cocker's "Ain't no Sunshine When She's Gone." The final example shows how MUSYS detects key and scale, which can be used to improvise along with Indian music. MUSYS analyzes music in terms of notes, chords, scale, and key. 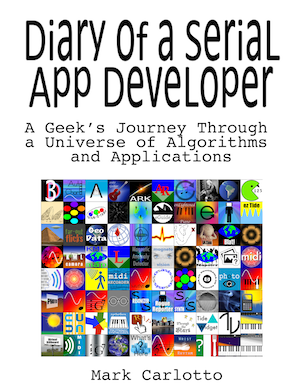 It starts by detecting musical pitches in an audio signal. A filter/correlator bank detects strong and persistent notes in the range displayed on the screen. Model-based techniques fit musical scales to melodies and chords to harmonies. Depending on the selected mode, MUSYS displays the note, chord, or scale/key continuously as the music played. Stop the music and move your finger along the display to play what had just been captured. The analysis part of MUSYS drives the smart synth, which plays only those notes detected by the pitch/chord detection algorithms. The top toolbar lets you select and convert any song in your iTunes library to a WAV file, which is then loaded into the player (top window). After a brief conversion delay (which depends on the length of the song), tap the play button to start the song. Alternatively you can load WAV files imported from email attachments. Tapping the play button starts/stops playing. Tap any part of the song waveform to move to that point of the song. The bottom toolbar controls the sonogram/chromagram display. On older devices reduce the length and/or range to reduce "stuttering" should it occur. The slider on the left in the middle toolbar controls the audio mix -- left plays just the song and right just the synth. Slide the control to achieve the desired sound balance. "Damp" dampens synthesized sounds, which works well when sliding your finger around the screen. When it is off, sounds decay more naturally. A low compute footprint FM synth provides 32 preset sounds, which are selected by tapping the next button. Melody -- extracts the dominant pitch and displays it as a melodic line. Tapping or sliding right to left plays the exacted notes. The note is displayed in the top middle of the sonogram/chromagram display. Scale -- accumulates the notes over the length of the display and determines the best matching key/scale. Sliding your finger top-down on the sonogram/chromagram plays notes in the current scale. Intervals -- performs harmonic analysis and displays the notes of detected chords. Chords -- play chords in the sonogram/chromagram. While a song is playing tapping the screen plays the currently detected chord. Stopping a song lets you play and display other chord notes in the sonogram/chromagram. In the settings table you can select/deselect what chord types are to be matched against the music being played. For example major and minor scales are usually sufficient to determine the key of classical music. Add pentatonic for rock, blues for blues, and bebop scales for jazz. The other scales are useful for alternative and experimental music. Other settings let you change the length of the filter/correlator bank, and the amount of smoothing, which is used in note and chord processing.